Brunch is my favourite meal on the weekend! So when we had a free Sunday morning from our usual dragonboat practice, my friend “I” suggested brunch. 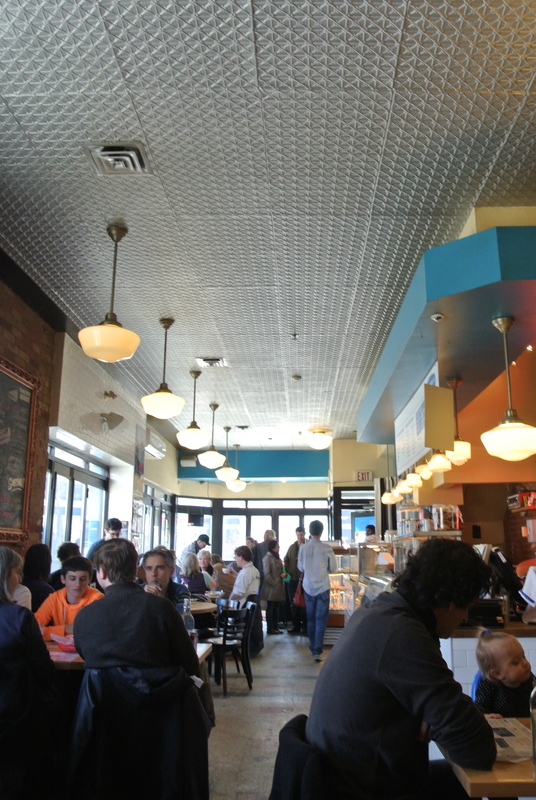 The tough thing about brunch is that most places don’t take reservations, which is a shame because most of us tend to go for brunch in groups larger than 2. 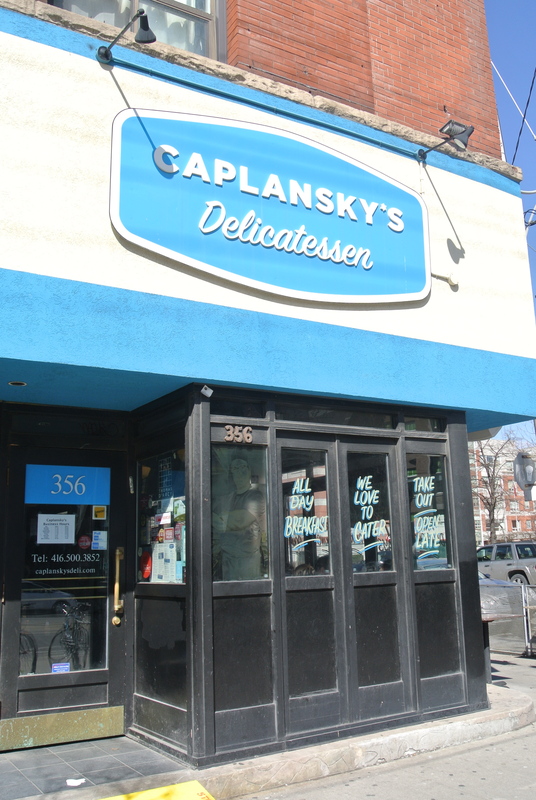 We arrived at Caplansky’s and had to wait for about 30 minutes but well worth it. We were seated in the centre area of the deli. The menu, of course, is very Jewish influenced so you won’t find pork served in this place! But there is definitely no shortage of meat here. This was my first time here even though I did eat from his food truck, Thunderin’ Thelma, at the Niagara Food Truck Festival last summer. 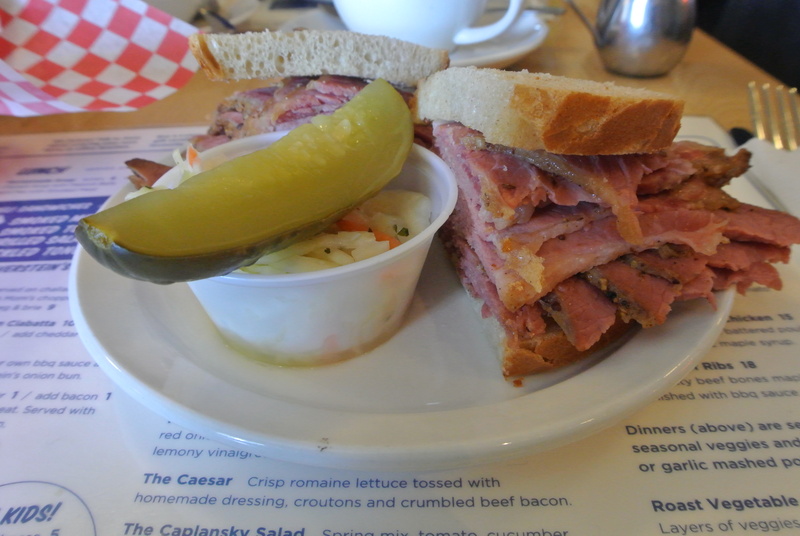 Asking the server what she would recommend as my first dish at Caplansky’s, I chose the classic Montreal Smoked Meat Sandwich! The meat is cut pretty thick and served on Silverstein’s rye bread. I squirted a bit of plain old yellow mustard (I’m not a big fan of dijon, unless its in a dressing) and took a big bite. I’m no expert when it comes to Montreal smoked meat but this tasted pretty good! It was moist and full of spice, exactly what you would expect from a Montreal smoked meat sandwich. The best part of the meal was the dessert – yes, dessert at brunch! 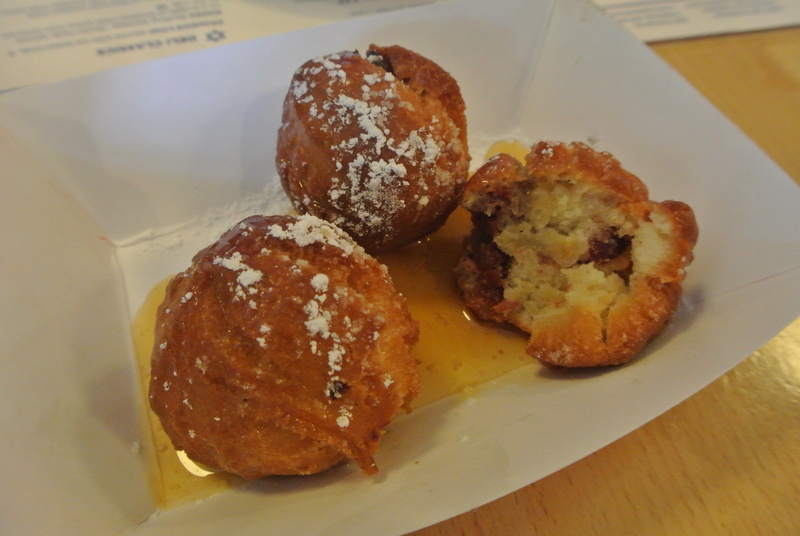 We ordered the maple bacon (not from pork) donuts……devine! 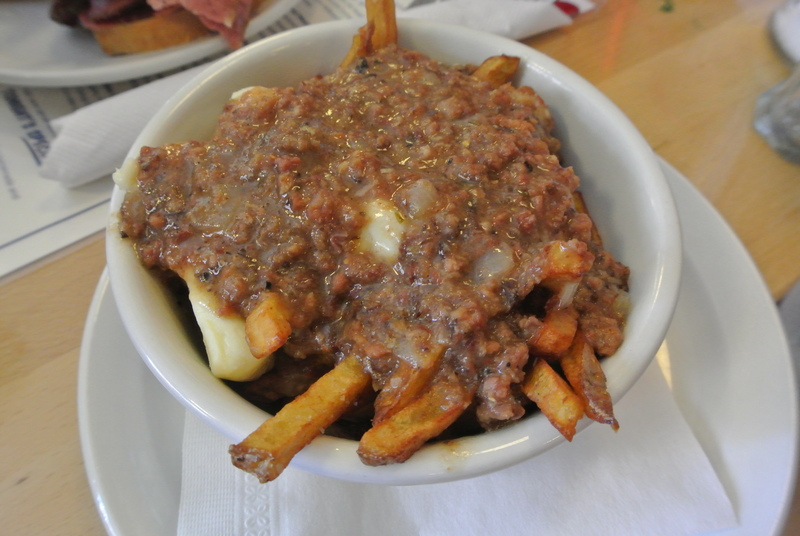 Just like how I remembered them since last summer……crispy exterior, dense with cubes of bacon and drizzled with maple syrup! A perfect ending to brunch! 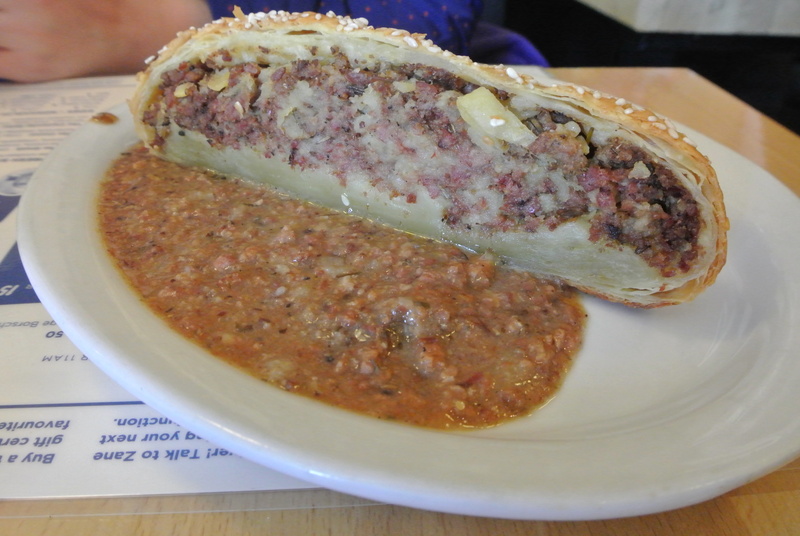 Knish – puff pastry stuffed with smoked meat, potato and spices served with gravy, YUM! The famous Smoked Meat Sandwich! Maple Bacon Donuts – tasty! Seriously one of the best donuts I’ve eaten! Great to know this is there! Wow that was odd. I just wrote an incredibly long comment but after I clicked submit my comment didn't shgow up. Grrrr... well I'm not writing all that over again. Anyways, just wanted to say wonderful blog! Howdy would you mind stating which blog platform you're using? I'm looking to start my own blog in the near future but I'm having a hard time deciding between BlogEngine/Wordpress/B2evolution and Drupal. The reason I ask is because your layout seems different then most blogs and I'm looking for something completely unique. P.S Sorry for being off-topic but I had to ask! No problem! I use wordpress! No problem, I use wordpress! Thanks for ones marvelous posting! I really enjoyed reading it, you may be a great author. I will make certain to bookmark your blog and will come back later in life. I want to encourage continue your great posts, have a nice afternoon!